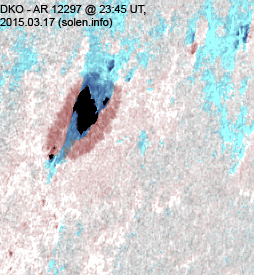 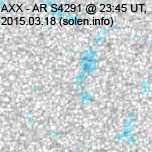 Last major update issued on March 19, 2015 at 04:35 UT. 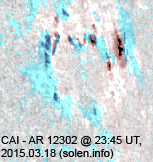 The geomagnetic field was active to major storm on March 18. 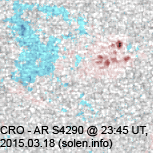 Solar wind speed at SOHO ranged between 540 and 656 km/s under the influence of CIR and CME effects. 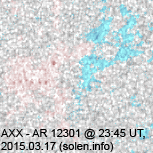 Solar flux at 20h UTC on 2.8 GHz was 114.8 (decreasing 3.9 over the last solar rotation). 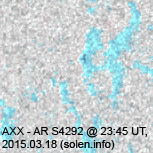 The 90 day 10.7 flux at 1 AU was 133.0. 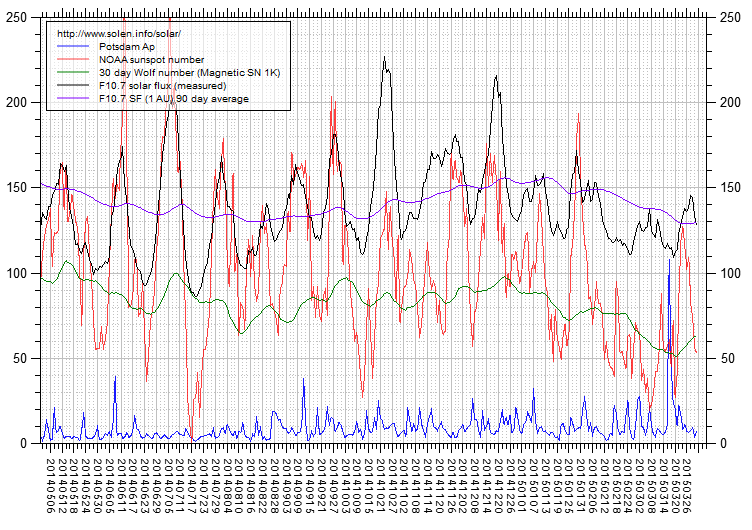 The Potsdam WDC planetary A index was 46 (STAR Ap - based on the mean of three hour interval ap indices: 46.1). 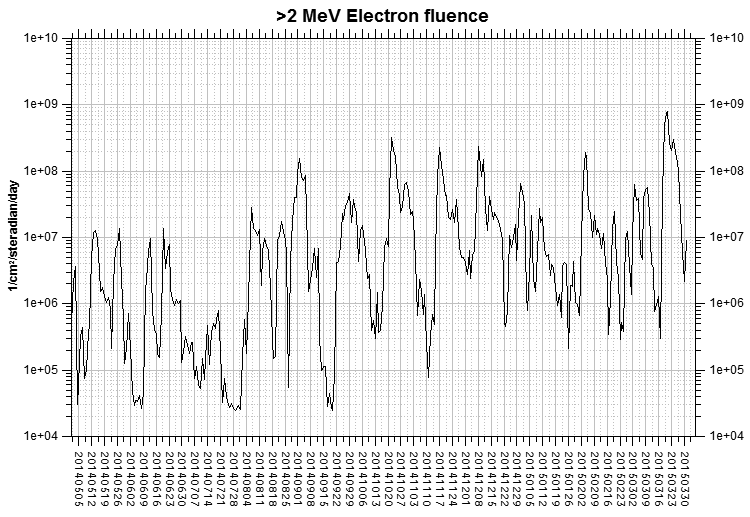 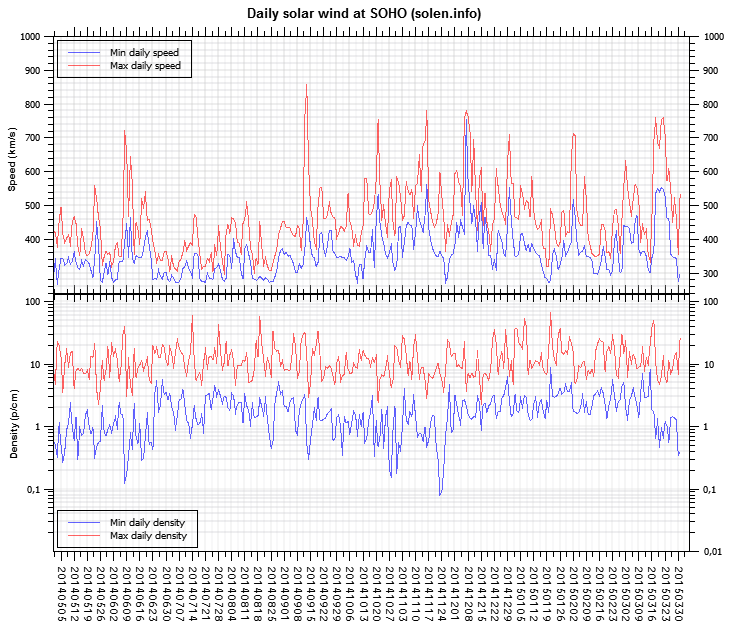 Three hour interval K indices: 65446555 (planetary), 44445544 (Boulder). 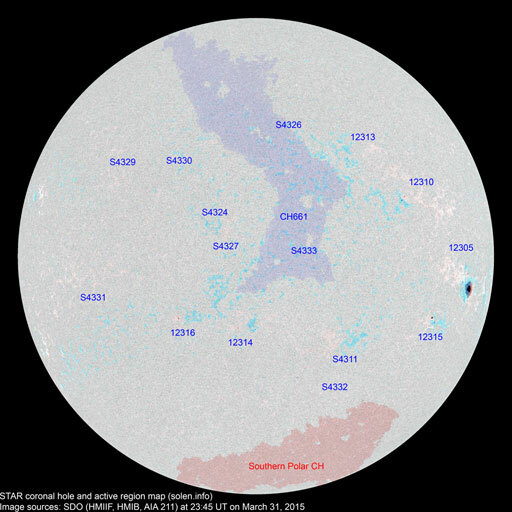 At the time of counting spots (see image time), spots were observed in 7 active regions using 2K resolution (SN: 113) and 6 active regions using 1K resolution (SN: 79) SDO images on the visible solar disk. 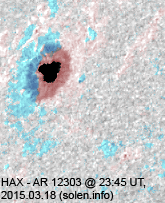 Region 12297 [S18W73] decayed further losing all leading spots and the magnetic delta which was previously observed in the single large penumbra. 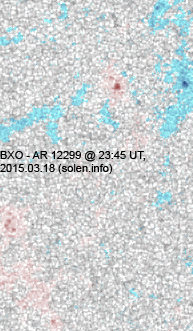 Region 12299 [S05W19] developed slowly and quietly. 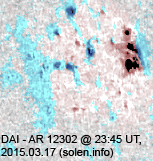 Region 12302 [N10W69] developed a magnetic delta early in the day and was a very active flare producer during the day. 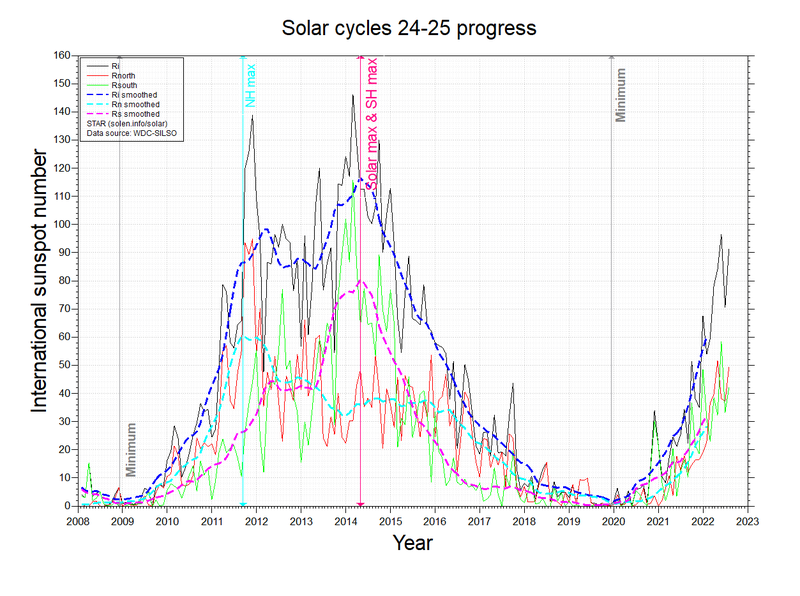 The delta disappeared late in the day and the region became more stable. 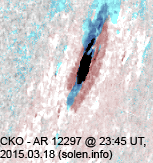 Region 12303 [N19E52] was quiet and stable. 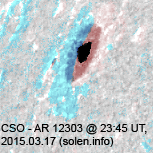 New region S4290 [N17W17] emerged with several spots. 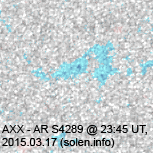 New region S4291 [S05E18] was observed with penumbra spots. 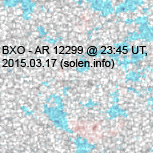 New region S4292 [S10E52] was observed with a penumbra spot. 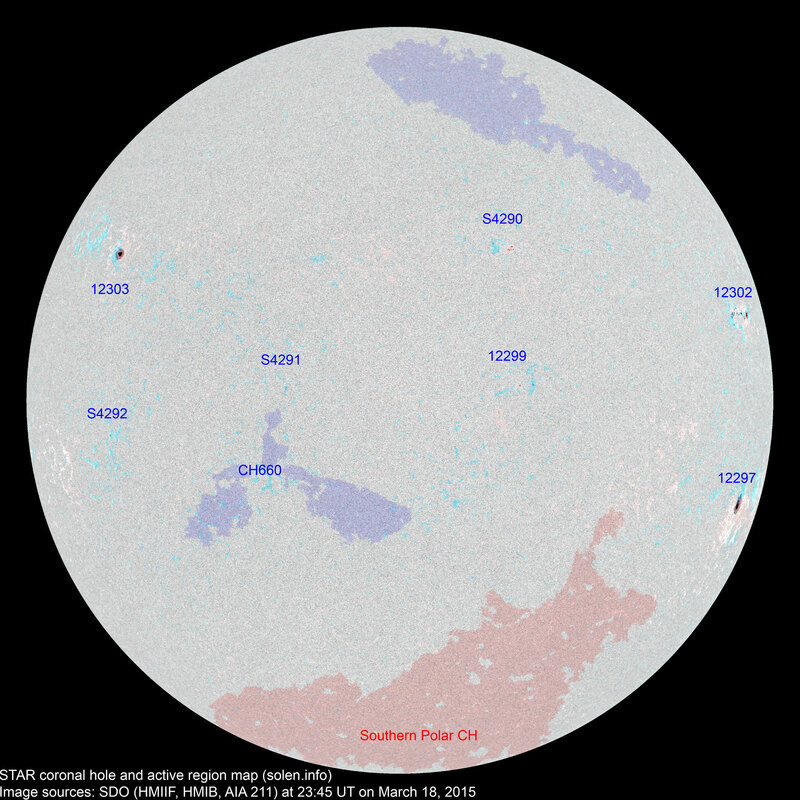 March 16-18: No obviously Earth directed CMEs were observed. 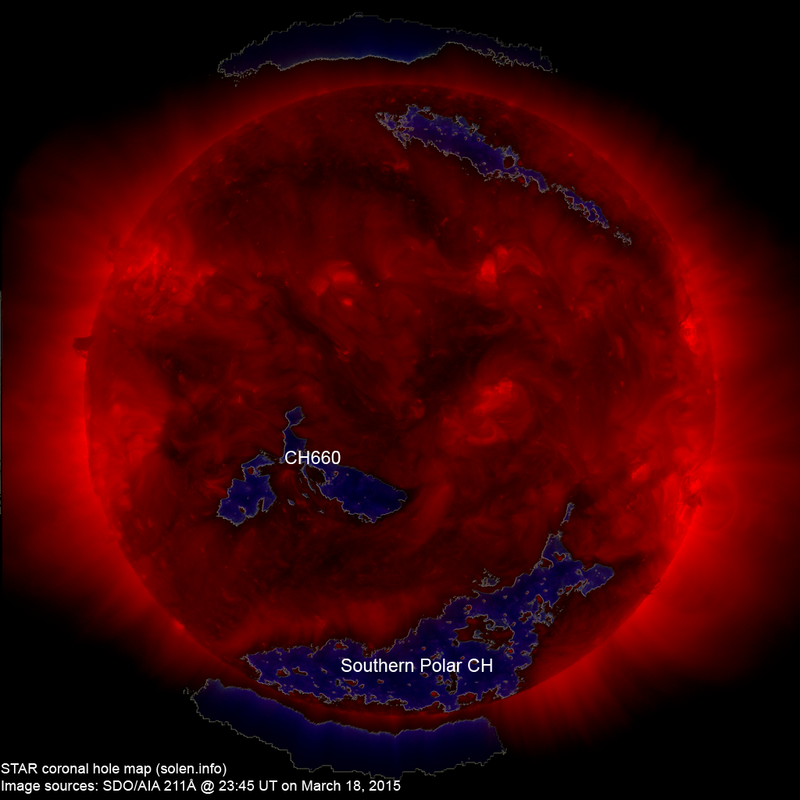 The geomagnetic field is expected to be quiet to active on March 19 and quiet to unsettled on March 20-21.